We could not decide where to go caching this week (our usual conundrum) and the weather was not looking too great for Saturday either. It looked like it might be wetter the further north you went, so we opted to go south and a group of caches on what looked like a nice walk in the Cotswolds caught my eye. We decided to head for Longborough (near Moreton in Marsh) and do the Sezincote Stroll series, followed by the Cachewalker Kids Trail. If we were left with any time, there were quite a few Swells and Wells series caches nearby and some quick ones in Evesham for the way home. We drove down the M6, M5 and then the A-roads to Longborough and parked up in the centre of the lovely village for our figure of 8 walk around the caches. After getting kitted up with full waterproofs, off we set. We decided to tackle the Sezincote Stroll in a clockwise direction to start off, as this was the longer of the two walks. A nice easy find at #3 started us off on the right track. A bit later on we passed the lovely Sezincote house and gardens – a wonderful yellow Cotswold stone building with a huge green onion dome on top of it! Just as we were nearing the top of our walk, we spotted a group of about 30 walkers taking a rest by where we thought the next cache might be. As we got nearer it was clear they were stood right by GZ. Nothing else for it but to strike up a conversation with them, mention geocaching and show them the cache. They looked a decent lot and not at all likely to endanger the cache. We did exactly this and quite a few of them were really interested in the idea of caching, with one lady even saying she’d look it up and take her grandchildren out caching :-). The rest of the walk was uneventful, apart from passing quite a few pheasant beaters out checking the hedgerows. Luckily none of them were anywhere near any of the caches. All too soon we were back near the Jeep and pondered stopping for our sandwiches or should we carry on for the next walk – the Cachewalker Kids Trail. We were enjoying our walk so much we decided to carry straight on to the next series. The Cachewalker Kids Trail looks to have been set for an event and involves 6 easy puzzles, designed for children to solve, and then a bonus cache at the end. Nothing too taxing here with all the caches being really easy finds (some were out in the open for some reason – we hid them back where we thought they should go). On the way round it started to rain properly and looked to be set in for the rest of the day. We were glad we had our waterproofs on and could just carry on caching as normal. We also picked up a couple of Swells and Wells series caches on the way round as we were walking past them anyway. Once back at the Jeep, Isaac planned a few drive-by’s and cache and dashes towards Stow in the Wold, before heading back towards Evesham on the way home. The Stow caches were easy enough. We were puzzled at one as it was a Church Micro but we totally failed to spot a church anywhere near it. Either we’re walking around with our eyes shut or the church must have been behind the buildings and out of sight. Either way, it was a bit odd. On the way up to Evesham we passed a delta68 Earthcache at Fish Hill. We’ve not done an Earthcache for ages so stopped for a look. We started off in the old quarry for a photo, then up to a viewfinder on top of the hill to pick up some required details. Next, it was down to the car park information boards for the rest of the details. All good fun and it was interesting to read about the area on the noticeboards. Just before we arrived in Evesham Isaac took us to a group of 6 easy looking caches around the village of Badsey. It was very dark by now but thankfully we were right and they were all indeed very easy finds. Just time for a few more before we head home so we went for the three caches in the Evesham By Pass series. Not a very inspiring series name but the caches were ok and just what we needed at this stage – quick finds not far from where we’d parked (it was raining really hard by now and everywhere was very damp). We thought that was it for the day and headed over to join the M5 just north of Worcester. 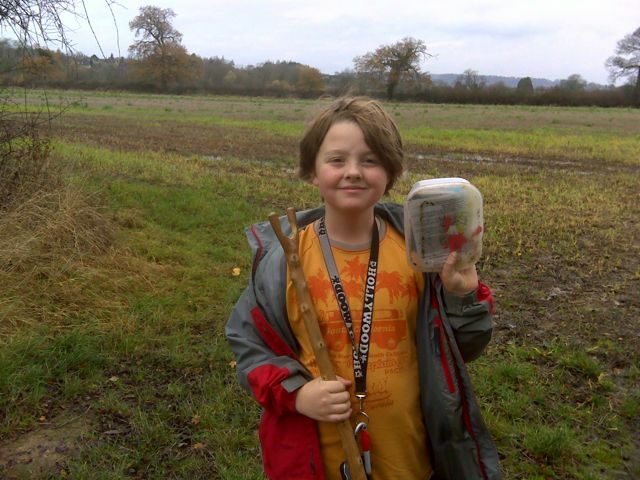 On the way Isaac spotted two quick caches just off the main road in Pershore. How could we resist ;-). Two more easy finds ensued – the last one was hidden as per the hint but had no covering on it and nothing nearby to hide it better with. We hope this one lasts as it’s going to look even more exposed in the daylight. We then headed home very satisfied with our day out caching. 37 finds for the day and some seriously nice walking. Just perfect and very close to our ideal day out caching.